can beef stroganoff be good for you? Some day I’ll stop talking about Ellie Krieger in my blog, but that day isn’t today. I just got about the best news a book editor can possibly get. Ellie’s new book, So Easy, just made the NY Times best-seller list. I don’t think words can describe how happy I am. Yes, there has been some celebrating. And I’ve been making even more recipes from So Easy, so here’s another teaser. Somehow Ellie was able to make Beef Stroganoff good for you, but honestly, nobody will be able to tell. This dish has all of the creamy goodness you’d expect. The recipe calls for serving green beans with grainy mustard on the side. Shhh, don’t tell anyone, but I hate green beans. I always have, and I can’t really explain it. 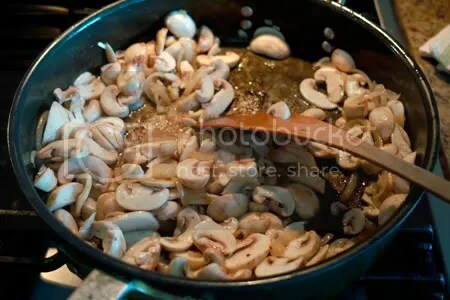 But I do love mushrooms, and this recipe starts out with a whole big batch of them, not to mention onions and garlic. The recipe is super easy to follow, made with your choice of top round, London broil, or flank steak. One of the keys to the recipe is the 2/3 cup of Greek-style nonfat yogurt you add at the end. This was my first time cooking with the Greek-style yogurt, and it worked out really well. My own special addition was a nice sprig of rosemary from my potted plant. The addition of the rosemary was so good in fact, I’m going to insist you try it too. The whole apartment smelled fantastic, and it made the stroganoff so much more aromatic. I think Ellie would approve. you don't have to stop 🙂 i love it! Justin, Congratulations! That is terrific news and this looks like an incredibly rich and delicious stroganoff. I will definitely head over to my local Barnes & Noble and get a copy of Ellie's So Easy cookbook.Bravo to you & Ellie! Of course it's good for you. How can it not be? 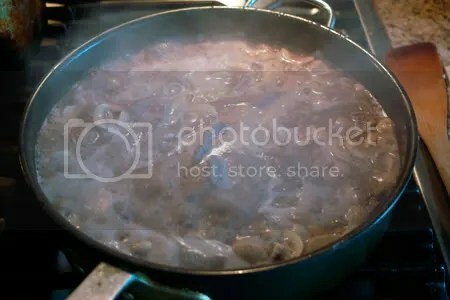 I was just recently talking about making some stroganoff with a friend. Then you go and post this. I do like the idea of adding the rosemary. I can just imagine the smell of it. ok I'm sold, the way you put it, it looks good. And I know that greek yogurt is really flavorful, so I bet it does add that level of taste just like the full fat one. Congrats on the book reaching the best seller's list! It doesn't surprise me at all. I love this book and I love all your posts about it. The beef stroganoff looks so delicious and I love that she uses greek yogurt. Congratulations. Nothing happens in a vacuum and I'm sure your efforts helped make this book a success. Have a great Thanksgiving. yay, ellie! that's funny. I LOVE green beans, but absolutely DESPISE mushrooms! I feel like I'm eating dirt. I wonder what it is about green beans you don't like…I have a friend who hates them too. hmmmm…. I want a bowl of that along with a good glass of red please! Thank u! Delicious! We love beef stroganoff at my house. I think that I even posted a "light" version sometime in the past year. I think that I used light sour cream, though. Yours looks wonderful. All of those mushrooms…. I am sure that it is good for you…as I mention before, I just eat calories that I enjoy…and this beef stroganoff is definitely a good one! Congratulations on having So Easy on the MY Times best seller list, it's an accomplishment that speaks volumes! 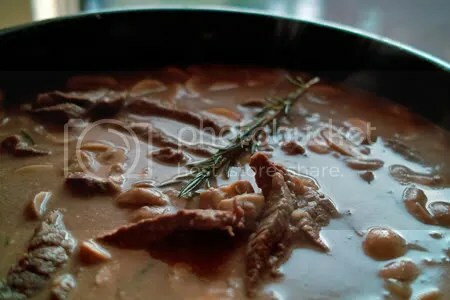 The beef stroganoff looks terrific, I'll have to try your tip on the Greek-style nonfat yogurt! YUM! you make me want to get that book! Beef Stroganoff is an old-school family favorite at our house, but it was never really exceptional or healthy. Unfortunately my chowder was not at ALL healthy, but it sure was delicious!! Thanks for the comments,and I look forward to reading more about Ellie's book on your site! 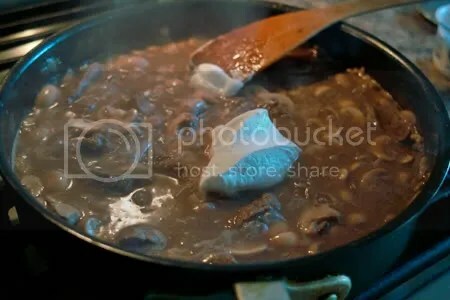 I love that picture of the fat mushroom chunks. And Ellie is the bomb! I'm Russian and never made this dish. Shame on me. Great idea on using Greek yogurt. Looks delicious. Congrats! That is excellent news. 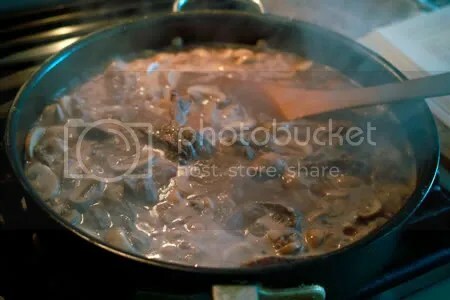 Love this beef stroganoff. Being easy to put together is an added bonus.